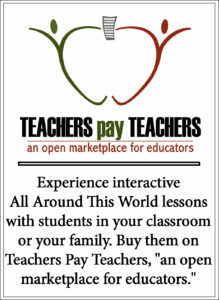 All Around This World’s classroom and homeschool lessons about Eastern Europe for kids introduce your family to Eastern European cultures through interactive fun . . . In Eastern Europe and the Baltics the grand jumble of passionate and invigorating musical genres find their inspiration in ancient, culturally rich traditions of the Turks, the Slavs, the Magyars, the Roma and the Jews. While some Eastern European music developed in staid church settings, much literally began in the village square during weddings, festivals and other community celebrations where music was public, joyful and intended to make everybody dance. From the playful, often-mournful Indian-originated music of the Romani to awe-inspiring Balkan Brass, from tongue-in-cheek klezmer to rapid-fire, accordion-rific polka, from trance-like Bulgarian vocal ensembles to Islam-influenced Bosnian sevdalinkas, some Eastern European genres are just plain moving, while others are so rhythmically engaging that when you hear them, your body can’t help but move. — Russia: we join the Red Army and kick our legs up high while doing the kalinka. — Belarus: we search for the elusive fern flower during kupalle. — Ukraine we and the Hutsuls do some wild dancing. — Poland: we get the excuse–and we’ll take any–to polka. — The Czech Republic we travel trough Czech history with the Plastic People of the Universe. — Romania: we try the the tricky cadaneasca. — The Former Yugoslavia: we might not be able to make much sense of the complicated conflicts in the region, but at least we can all dance to Balkan Brass and wish each other a happy Vasilica. — Bulgaria: we end our journey by getting married wedding as Bulgarians have for 500 years–with lots of traditions and asymmetrical dance.